Sculpture Racing: Learning Math and Science through Design Challenges engages middle and high school students and teachers in designing 3-D representations (mobile sculptures) that illustrate biology, chemistry, and mathematics content; presenting the thinking underlying their design; and racing them in proof-of-concept races. For a start, we have organized collaborations with the Rindge School of Technical Arts (9-12) in Cambridge, and the Kennedy School (K-8) in Somerville, as well as nonprofit educational organizations. Research and development will be conducted as a collaboration between Technical Education Resarch/TERC and People’s Sculpture Racing (PSR). PSR’s role is to ramp up expansion of the use of its learning model, which is project- based, collaborative, accessible, adaptable, and fun–and additionally highly flexible it its capacity to teach different science topics–to new schools, non-profits, communities, and underserved populations (see “About Sculpture Racing” addendum). TERC’s role will be to ensure that PSR’s science teaching is rigorously planned and evaluated. TERC will develop modules for each content area, each with solution- focused design thinking, such as defining a problem, conducting research, formulating a solution, creating and implementing a prototype, and learning from it. Deliverables will be module toolkits, including MA state science and math standards alignment, walk-through of the design process, embedded assessments, a student workbook, building materials, CAD software, and access to a discussion web site. The project can positively impact STEM education in the two towns, because its underlying design thinking provides opportunities to develop skills, tools, and content knowledge needed for the workplace and civic life. It will stimulate interest in STEM, encourage collaborative learning, and result in teachers incorporating new STEM educational opportunities. Outcome 1: Students will know the biology, chemistry, or mathematics content and concepts that underlie their sculpture. Measures for comprehension of specific grade level content and concepts as specified in MA state science and mathematics standards for biology, chemistry, and mathematics will be created from observation, interview, and survey data collected during conceptualization, building, and presentation of the sculptures. Outcome 2: Students will demonstrate the ability to apply skills of design thinking. Measures for defining a problem, conducting research, formulating a solution, creating and implementing a prototype, and learning will be created from observation, survey, and interview data collected during conceptualization, building, presentation, and racing of the sculptures. Outcome 3: Students will demonstrate interest and engagement in STEM. Data from observations and interview responses will be used to probe participants science learning in terms of interest and engagement. The project has the potential to positively impact STEM education in Cambridge and Somerville as the design thinking that underlies the approach provides opportunities for students to develop skills, tools, and content knowledge that are needed to participate in a society where problems are increasingly complex. Additional benefits are that it may also broaden participation and interest of middle grade and high school students in STEM, encourage collaborative learning, and result in teachers incorporating new STEM educational opportunities that include technology. TERC’s relationship with the Cambridge and Somerville schools is currently mediated by People’s Sculpture Racing. The project begins its first year with collaborations, described in the attached letters, with the John F. Kennedy School (K-8) in Somerville and the Rindge School of Technical Arts in Cambridge (high school). We will discuss with them their learning needs for 6th & 7th grade and 9th & 10 grade, respectively, in math, chemistry, and biology. We will hold fall and spring semester-long after-school programs at both schools, pairing PSR instructors with school instructors. There will be vacation camps and weekend workshops with PSR’s three non-profit collaborators. TERC staff will collaboratively design the instructional materials with PSR and school instructors and observe and evaluate. In our second year, integrating the insights and evaluations of the first year, we will continue the above initiatives, add more organizations, and produce inter-school and organization races, and start working towards our third year goal of bringing sculpture racing into the in-class curriculum. Year four will continue all of the above initiatives, while TERC develops and completes its deliverables. TERC’s main source of revenue is grants. Staff’s research and development efforts are supported as funding opportunities align with the research. Staffing is typically available within the organization to support such efforts or hired as needed. Staff tend to stay at TERC for many years as there are opportunities across the organization’s work to match their expertise. PSR has been to date a voluntary organization with limited bandwidth. Biogen’s grant monies used for program and administrative salaries will allow very active outreach, collaboration, and project development-more instructors, sites, outreach, and STEM community building. As an educational research and development organization that strives to make improve STEM education and learning for all, TERC collaborates routinely with other nonprofits, including Concord Consortium and EDC. These collaborations are intentionally designed to create synergies that take advantage of the strengths of TERC and its partners to create more robust and effective STEM teaching and learning in formal and informal settings. For the proposed project, TERC will collaborate most closely with PSR, which teaches STEAM workshops and holds public sculpture races. PSR collaborates closely with Parts & Crafts and the Somerville High School Fabville educational innovation spaces in Somerville and arts making space Maud Morgan Arts in Cambridge. Our instructors have worked with both organizations to bring youth and families together to build racing sculptures. They taught PSR about the accessibility of the project to younger people, and more than anything else transformed the organization into a community project. PSR has also had close collaboration with the Cambridge Science Museum in its first year, and on a continuing basis with the Cambridge Science Festival, which hosts PSR during it’s the festival in multiple events, including a race. The Cambridge Arts Council has acted as PSR’s fiscal umbrella and has hosted it during its summer art festival. Catalyst Conversations, another collaborator, continues to build important conceptual connections between the arts and sciences. PSR participates in all of the Somerville STEAM Socials and Cambridge’s EL STEAM Network events. It holds outreach demonstration events in East Cambridge Schools, as organized by Cambridge’s STEAM Coordinator. For more than a decade, the TERC team has been dedicated to increasing access to STEM opportunities and preparedness for students typically under-represented in STEM college and career pathways. Specifically, our research and development of universally designed signing dictionaries has provided access to signed STEM vocabulary for students who are deaf and hard of hearing and use American Sign Language to communicate. Each signing dictionary contains a 750+ content- specific, core-based terms and definitions, most including an illustration or example and virtual characters-avatars-that sign. Evaluation of the impact of these resources in classroom and informal science settings reveal they are effective in helping deaf and hard of hearing children to sign, explain the meaning of, and use STEM terms integral to their science learning. The dictionaries’ interactive features promote individualized instruction for a wide range of learners and standardize signs used throughout their education. TERC’s Signing Math & Science body of work demonstrates the project team’s success in effectively serving and engaging students behind grade-level academically and who have other barriers to graduating high school. When People’s Sculpture Racing started offering workshops in creating and building racing sculptures, it became clear that diverse youth delighted in the model. As there are many parts to each project, participants collaborated with each other on challenges they found difficult. Youth not normally interested in focusing on technical elements were captivated. PSR instructors easily customized lesson plans to different skill and education levels, bringing pre-made materials as helpful. Because there is a real-world performance element, PSR’s teachers have easily seen missed components of sequential learning, e.g. a H.S. student not able to find ¾ measurements on a ruler. We will incorporate the Biogen Foundation logo and a short description of the Foundation’s contribution to the project on all of the materials developed for the project including instructional materials, project websites, press releases, publications, and promotional materials. Additionally, we will hold an annual sculpture race called the Biogen STAR Initiative Sculpture Race, with participants from all of our programs. Sculpture races are competitions of artful mobile contraptions raced without obstacles. 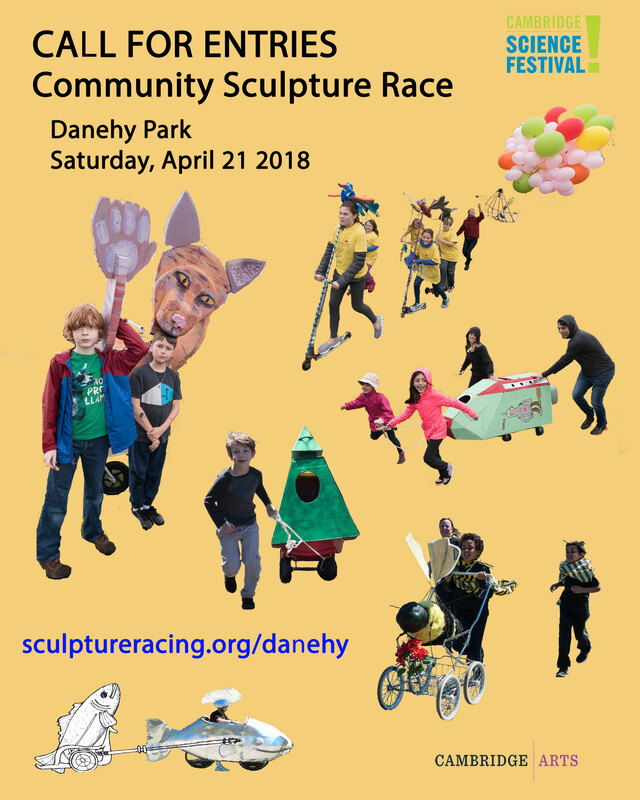 We currently hold a Community Sculpture Race at Danehy Park as part of the Cambridge Science Festival each April, and a juried artist-focused race during the Cambridge Arts River Festival each June. We have held sculpture racing workshops at the MIT Museum, Artisan’s Asylum, Parts & Crafts, Maud Morgan Arts, educators’ studios, the Charles River Museum of Transportation and Technology, and in Rockland, Maine. Sculpture Racing is a revival after 30 years of a local 1980s project, founded by artists Geoffrey Koetsch and Kirby Scudder, which included kinetic sculptor Arthur Ganson. Ganson makes mechanical art demonstrations and Rube Goldberg machines with existential themes. His kinetic sculptures, among the most beloved features of the MIT Museum, explore the nature of oiled surfaces, object manipulation, and slow explosions, and are created from a range of materials that he fabricates or finds. Early years also included the late Bill Wainwright, a celebrated public artist who worked with Buckminster Fuller. All were terrific designers and educators with engineering skills, who sought to create profound works through design and kineticism. Following that lead, PSR in this century attempts to expand the use of design and kinetics into the sciences. Our first race was a circumambulation of the MIT Museum of prototypes, preceded by an exhibition and lecture inside the Museum. 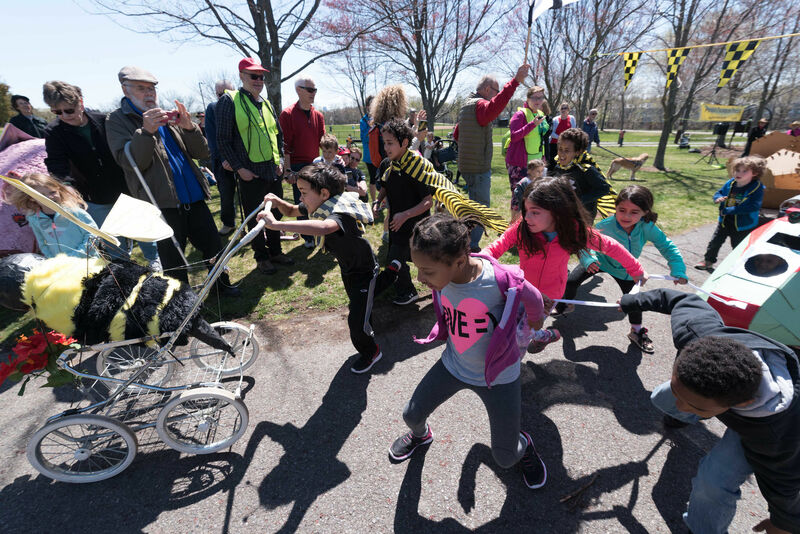 A recent work by a physician and former middle school science teacher and her family designed and raced a bee with a four-part wing movement. Another work kinetically moved atoms; a third featured a moving solar system (an orrery). The learning focus can involve engineering the part of the contraption that moves; or it can design kinetic parts activated by the wheel’s movement to examine form and function, as with the bee; or it can simply be a non-moving 3D schematic of something under exploration, attached to a pre-supplied chassis and wheels. offer its design challenge in the service of basic science and math. Typically encountered in sculpture design and building are 7th grade topics in operations with rational numbers, and working with expressions and linear equations; solving problems involving scale drawings and informal geometric constructions, working with two- and three-dimensional shapes to solve problems; and 8th grade topics in analyzing two and three dimensional space and figures using distance, angle, similarity, and congruence. For biology, we look for instance to kinematics addressing structure and function. We would expect to work with folks at MIT and Cambridge working on biologically-inspired engineering. Races can be structured to challenge structures for their ability to survive with respect to other structures, a grade 7 topic. For chemistry, it is possible to model movement and structure kinetically. Insofar as there exist computer assisted design (CAD) applications and resources accessible to middle or high school students, we can incorporate that, preparing youth for chemistry and possibly biology modeling. Our curriculum development team includes two scientists. Daniel Rosenberg runs Lecture-Demonstration Services at Harvard University, where he works with physics and chemistry department students to create models representing scientific principles. Jeff Del Papa is an interdisciplinary scientist and engineer whose constructions utilize scientific principles with wit alchemized in his marvelous after-school programs. An evangelist for science education, he directs the New England Model Engineering Society. Another integral member is Kim Bernard, a kinetic artist who has taught kinetics and arts, K-college. She worked as with the Harvard Physics Department as an artist in residence and put their theories to work in a racing sculpture. In 2017, she led 100 students in the Camden-Rockland Middle Schools to design, build and race sculptures. Biogen will interview select candidates on March 19, make a final determination on Friday, April 20, and announce the results on Monday, April 23. Mary E. Skipper, Somerville Public Schools Superintendent; Ben Sommer, Fabville Co-Founder; Katie Gradowski, Co-Director, Parts & Crafts; Jason Weeks, Cambridge Arts Council; Amy Shorey, Shorey Consulting; Sue Cusack, Lesley University STEAM Learning Lab Co-Director; Candyce Dostert, Cambridge Public Schools Program Developer and Grants Specialist; Susana Hernandez Morgan, Somerville Schools Director of Communications and Grants; CPSD/EL STEAM Network advisors; Jason Behrens, Innovation Specialist, Somerville Public Schools; Nicholas Herold, Herold Consulting; Michael Shia, Artisan’s Asylum; Corey Munro Shea, Director, Maud Morgan Arts.